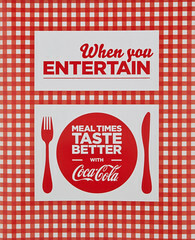 Coca-Cola has teamed up with Tom Aikens, Alex James, Liz McClarnon and myself, to create a limited edition stylish recipe book called ‘When You Entertain’ – a modern twist on the original Coca-Cola recipe book from 1932, which was written by the legendary American Hostess Ida Bailey Allen. ‘When you Entertain’ celebrates the brand’s rich heritage and association with food and family occasions over the last century. We have each created a series of dishes which evoke intimate memories of mealtime occasions with family and friends, celebrating the fact that food is very much a social event. The family inspired recipes are divided into four easy mealtime categories; Weekend Brunches, Family Mealtimes, Saturday Night with Friends and Easy Lunch. My recipes include homely favourites such as Sausage and Mash with Onion and Thyme Gravy, and Bramley Apple Pie. This unique celebration of mealtime occasions with family & friends is available exclusively at Harvey Nichols from September 20th 2010. Enjoy!